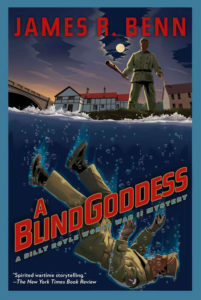 In an exclusive interview with Lowestoft Chronicle, James R. Benn discusses his much-loved wartime mystery novels, his inimitable military sleuth Billy Boyle, and his latest book, Blue Madonna. Lowestoft Chronicle [LC]: I read an article in the New York Times that suggested, in part, that your interest in this era of history came about after you found parts of a 1940s-built DeSoto car in the wooded backyard of a house you’d just purchased. The article goes on to say that writing historical fiction set during WWII began as a business decision. How accurate are either statements? James R. Benn [JRB]: The DeSoto story is absolutely true! Sometimes unearthing historical tidbits is literal. As far as the business decision, yes, I did do research into genres and what was popular. Happily, I found that historical mysteries were the fastest-growing sub-genre, so I knew I was on to something. 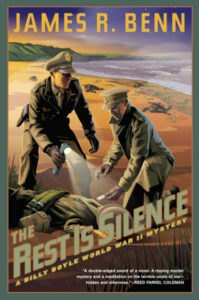 Back then, 2003 or so, there were practically no historical mystery series set within the Second World War. LC: Did you have an interest in writing fiction prior to turning 50? 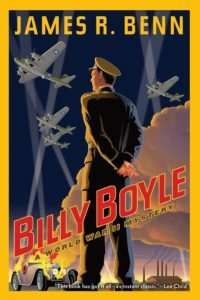 Are there any particular authors you can credit with having shaped your writing or inspired the Billy Boyle character? JRB: I think Robert B. Parker’s Spenser inspired my attempt at pithy, concise dialogue. I found dialogue to be incredibly difficult. Parker made it read oh so easily. But from there, I think the most important influence was Dalton Trumbo’s Johnny Got His Gun. It demonstrated for me the power of the internal voice. The next influence was definitely Paul Fussell, whose Wartime memoir had much to do with Billy’s view of the military. Fussell was a combat veteran, philosopher, and iconoclast. All of his works are important reading. LC: I’ve read that you had difficulty placing Billy Boyle with a publisher (a two-year and two-hundred agent endeavor). Was the version Soho Press published the same as the one you were submitting two years earlier, or did it go through a series of changes on the route to publication? And how would describe your experience getting your first novel, Desperate Ground, published? JRB: No, the manuscript that was accepted was essentially the same. I think it helped that by that time, I had written the second book in the series, demonstrating I could write more than one book. That first novel was accepted earlier by a start-up publisher who thought Print-On-Demand technology was going to sweep through the publishing industry. It didn’t and he promptly went out of business. I was able to retain the rights, and now On Desperate Ground is available from Open Road Media. LC: I recently read Desperate Ground and was surprised to find Boyle and Harding featuring so heavily in the novel. Their relationship is much the same as it is in later books. You also reference some of the missions Boyle has been involved in, like Norway and North Africa. Did you already have other adventures in mind for Boyle while you were writing this first novel? JRB: So here's the story on Desperate Ground—it was my first book, and Billy was a secondary character. When I wrote it, I did not yet have plans for a Billy Boyle series. Afterwards, I saw the potential for him—part of that business decision I talked about. So I brought him back to the start of the war and made him the protagonist and told his story in the first person. Then, when I took the book to Open Road, I decided that Billy's universe had changed so much that the character in that book—now titled On Desperate Ground—had to be changed. So in that revision, Billy and Harding were given new names and each a slightly different backstory. I thought it would be too confusing for readers to have one book out there with Billy at the end of the war. LC: The Boyle books are typically full of action, murder, suspense, espionage, mystery (invariably the whodunit kind), and occasionally romance (normally between Boyle and Diana Seaton). Surprisingly, especially considering you’re up to book #11 now, you never get that sense of déjà vu. The locations are different and wide-ranging (even Boyle’s return visits to England are to new destinations); secondary characters are varied and have depth and complexity; and the plots are not formulaic. What is your process for beginning each new adventure? Are the books written from beginning to end? How do you ensure that themes and side characters are distinctly different from book to book? JRB: You’ve hit upon the challenge to this kind of series. Each book needs to be fresh, which does mean not duplicating geography or thematic material. That’s one reason I liked the ‘break’ from the timeline made possible by the South Pacific interlude in The White Ghost. I do pay a lot of attention to selecting an approach and topic that will be different for each book. That’s not easy, especially since some readers like things to remain the same (sort of). I recall that when Billy went solo to Northern Ireland in Evil For Evil, there were some friendly complaints about missing Kaz. But that was a homecoming of sorts for Billy, and he had to deal with it alone. LC: Initially, when I began the series, I thought that Lieutenant Piotr Augustus Kazimierz (“Kaz” for short) was a curious choice of partner for Boyle. The loss of his parents and loss of his sweetheart give him a bleak, tragic persona, which contrasts Boyle’s rather upbeat, outgoing personality. Why did you decide to make Kaz a core character? Did you always intend for him to lose Daphne, or was this a decision that came later? JRB: Actually, it was supposed to be Kaz who died in the first book. I knew I needed a loss that would cause Billy to see the war from a personal point of view. But as I wrote, I saw one limitation of the first person POV; everything has to happen through the eyes of the protagonist. So I decided he did need a sidekick, someone to talk with and go offstage for tasks when needed. So, exercising the author’s god-like powers of life and death, Daphne became doomed. LC: The only romantic figure in Boyle’s life is Diana. From the start, there’s always been this sense of it being a troubled relationship. Was there ever a temptation to allow someone else to come into Boyle’s life and replace Diana? JRB: No, Billy’s a one-woman man. It is far more likely that Diana will not survive the war, and Billy will have to deal with that. But I’m not sure, so don’t send flowers yet. 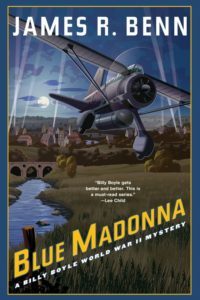 LC: In your latest book, Blue Madonna, Diana has assumed a new identity and is now stationed in France, helping the French Resistance. She plays a larger part in this adventure and is involved in many of the deadly battles, often fighting alongside Boyle. In a way, you’ve relocated their romance to the battlefield: “Enemies approaching, friends fleeing, and less than a hundred and twenty seconds to oblivion, nothing else mattered but the taste of her, the scent of her hair, the salt of her tears, her warm lips, and her body pressed close to mine.” But in doing this, haven’t you added a lot of extra barriers, constraining their relationship? After all, they’re not supposed to know each other and, in order to protect her identity, Boyle must think of her as a different person. JRB: That’s exactly the problem Billy faces, having to keep her real identity—not to mention his—a closely guarded secret. That moment you bring up is the first time they can acknowledge each other, and it is only within those precious seconds as a detonator is counting down to an explosion that they can exist as who they are. I find the question of identity fascinating, especially in the midst of tumultuous times that force the characters to question who they truly are and who they have become. And I like the idea of presenting readers with similar questions, or at least causing people to wonder how they would react under even a small portion of the pressures Billy and company face. LC: I thought it was a fantastic idea to begin the third book, Blood Alone, with Boyle suffering from amnesia. Unlike others in the series, the whodunit element is replaced by a “what has happened” one, with Boyle puzzling over his identity and what has caused his injuries, and the reader wondering why he’s in southern Italy, what his mission is, and, well, just about everything else. It’s obvious that a huge amount of research goes into each book (in fact, I read somewhere that your wife, Debbie, who’s a psychotherapist, was an invaluable resource for this book in helping provide insight into the effects of amnesia). 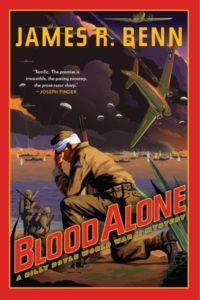 Did Blood Alone require more background reading than usual? Was it a trickier novel to write? JRB: That came about because by the third book, I was already tiring of explaining the backstory. So I thought, why not have Billy do it for me, by re-learning who he is? Now the amnesiac protagonist is a bit of a trope, but I did take pains (with much-needed help from Debbie) to come up with a type of amnesia that would fit the bill – psychogenic amnesia, which is short-term memory loss due to physical or psychological trauma. With that roadmap in hand, it was a lot of fun to let Billy wonder about, and discover, who he was. LC: In the case of all your books, you get a real sense of place, people, and customs. In The White Ghost, for example, you educate us in the exotic local dialect, the weather, the food, and the clothes—there’s even this fabulous scene where you describe the native burial process: the decaying head is removed from the body, stuffed with flowers, bound with vines, and then taken to the beach and thoroughly washed in the ocean. As someone who was a longtime librarian, would you say you have an advantage over many when it comes to historical research? JRB: I typically start reading for research six months before I start writing. I will dig up anything on the topic; for The White Ghost, I found a number of travel books from the 1920s and 30s about visiting the Solomon Islands. They were chock full of tidbits like that. I found it fascinating to describe a culture in transition, going from practically the Stone Age to the modern era within a few years, due to the progress of the war. I guess the advantage I have is that I use inter-library loan a lot; many of the titles I seek are hard to find, and having a great local library to help is critical. LC: Soho have consistently published a Billy Boyle mystery every autumn. Considering the amount of time required for research, how long does it take you to actually write the novel? JRB: Outside of research, the writing process to get a readable draft in place usually occurs between October and July of each year. Then editing, editing, editing. I think I may work a bit more slowly and deliberately than some writers, so it’s usually a matter of fine-tuning prose, not throwing out thousand-word chunks and starting over. There’s also research for the next book starting up as I am finishing the current work in progress. LC: A Blind Goddess is one of my favorites. It’s not unusual for Boyle to investigate multiple cases simultaneously, but in this novel, you have other provocative distractions going on – and not just racial tension between army divisions, but child abduction, as well. Having Boyle carefully navigate these contentious issues while investigating three complex and puzzling cases seems like an enormous challenge. Additionally, there’s his ongoing account of his pre-war relationship with his estranged Boston pal, Sergeant Eugene Jackson (aka Tree), which is as intriguing as the other excellent plotlines. Why did you decide to pack so much mystery into the novel? Did you approach this book differently from others? Was it problematic getting these storylines to intersect? LC: Throughout the series there are a number of multi-layered secondary characters that are not easily forgotten. In The Rest is Silence, the two who stand out the most are David Martindale and Tom Quick. You can’t help but feel immense sadness for both. (David, Kaz’s old Oxford school friend, is a disfigured fighter pilot whose wife can’t bear to look at his scarred face, and Tom, the local policeman, is an ex-RAF pilot whose family was bombed to death and who in turn is haunted by the lives he’s destroyed overseas through the thirty bombing missions he took part in.) And I still remember from the first book those poignant scenes between Boyle and the grieving widow, Victoria Brey. I feel like these small characters have a big impact on your novels. Was that always your aim? In fact, sometimes these secondary characters are also well-known historical figures (actor Sterling Hayden, John F. Kennedy, and the “Queen of Crime” herself, Agatha Christie, have all made appearances). Are you at all daunted about giving voice to big real-life characters or concerned how readers will receive them? “One old man dies and they send a lieutenant. Thousands die in the air, at sea, all over the world, and then who do they send? No one.” She laughed some more. At first, I thought she was crazy, and then I thought it over. It really didn’t add up, did it? Tom Quick, for instance, represents those who came through their service with no visible scars. David Martindale, for all his horrible burns, has a better chance of making a life for himself. I think it’s vital for any novelist writing about war to include characters who represent suffering and endurance, since physical and emotional pain is such a part of war. A character has to have something to communicate, something important, other than information that merely moves the mystery plot along. As for the historical characters, yes, there is a responsibility to get them right, to find and nurture some essence of them that allows them to live on the page. I sometimes think of it along the lines of how an impressionist works; finding a vocal or personality twitch and exaggerating it somewhat in order to convey the reality of that person. The toughest character to write was Sterling Hayden. He would have taken over the whole damn book if I’d let him. A truly larger than life guy. LC: Blue Madonna has all the best elements of a Billy Boyle adventure. Packed with intense skirmishes and suspenseful action in a visually interesting overseas setting—I think the brooding Forest of Dreux with it’s “White Giant” mythology and the dramatic gunfights that take place there, as well as the grand French château with its underground treasure house of the ancient Druids and labyrinth of tunnels beneath, would translate to the big screen very nicely. There are also some harrowing scenes involving the SS. Did you have reservations about including such graphic scenes? And are there any times during the plotting stage where you wonder, am I putting Billy through too much or, for that matter, putting Diana through too much? JRB: The character of Billy Boyle is a witness for us all, and as such he does bear a heavy burden. I feel I have an obligation to include the essential truth of what happened during the war, and the SS action as described, while it occurred in a fictional village, is true to many atrocities that happened in France and elsewhere. Billy does a moment during the climactic battle scene when he sees his own face in the face of a German he has just killed. So all this is wearing him down, spiritually and emotionally, as it must. 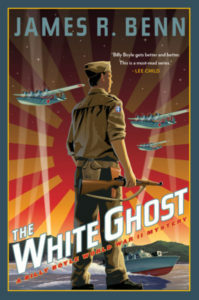 LC: In this novel, Boyle is given some surprising assignments: to infiltrate a criminal gang, a find-and-rescue mission in London, and a parachute drop behind enemy lines to deliver a radio and weapons to the French Resistance and pick up a vital solider. Given that, as a civilian, Boyle’s occupation is police detective, and in military uniform he’s often employed to investigate murders, wouldn’t you say that here Boyle is unnecessarily being put in harms way? JRB: I’m sure he’d agree. But the overarching goal here is to stop the criminal enterprises, which are draining the war effort of supplies, and his mission is connected to that. It was also my way of incorporating D-Day into the narrative. I had been trying to work out how to do that, and the June 6th invasion itself seemed so huge and daunting that I couldn’t find a way into it for Billy, until the notion of this mission occurred to me. LC: “I zigged inside the trees this time, running straight up the road and finding my Kraut kneeling, ready to fire at where I would have been. One shot through the helmet took care of him.” As the series has progressed, would you say Boyle has become desensitized to death and the act of killing? JRB: Big time. And he knows it, or at least the part of him that remembers what it was like not to kill. In that scene, he is also reacting to the loss of life—possibly Diana/Juliet’s—that this particular German caused. As always with Billy, when things get personal – watch out. LC: I really like the ghost story element to the intricate plot—a haunted forest, a haunted painting, and the fantastic Château Vasseur with its buried Druid temple and secret vaults and chambers. There are all these myths, stacked secrets, and eerie stories from the past. Edgar Allan Poe elements are also involved. Did this novel stem from your research into the Castle of Robardière, or from reading about black market operations, or simply from reading ghost stories? Also, the murder mystery angle is presented much later than expected (practically halfway through). Did you deliberately hold out on the whodunit element, or was it more a matter of waiting for the right opportunity? JRB: I was scouting out (virtually) locations for the chateau, and stumbled upon those wonderful stories. It was impossible to pass up including them as parts of the plot and setting. The White Giant and his invitation were tailor made for this story. I am a big fan of Edgar Allan Poe and wore out the grooves on a record album I had as a kid of Basil Rathbone reading Poe. As for the timing of the first murder (although not the first crime), I did want to wait until we were in those underground tunnels. So creepy. And I must admit I am growing more interested in the personalities of the people around these crimes than in the murder itself. 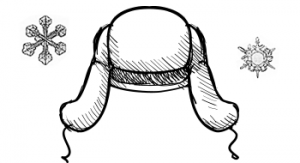 For instance, there is a character named Dogbite, after the scars on his face. He came to me after sitting at a ball game and overhearing a woman, in a deep southern accent, say “Him and me been through Hell and half a’ Georgia together.” In that moment I knew that line would be in the next book, and that’s how Dogbite came into my world. LC: What’s next for Boyle? And with the Billy Boyle series in such high demand, do you have time to work on side novels or projects? JRB: The manuscript for 2017, The Devouring, has been sent into Soho. The Great Devouring is what the Roma people call their holocaust at the hands of the Nazis. I am working on a non-Billy project right now, a young adult book titled Freegift, set during the American Revolution. A sixteen year-old slave in Connecticut is told by his mother on her death bed that Benedict Arnold is his father, and makes him promise he will seek him out. My elevator pitch is Roots meets Hamilton with pirates. 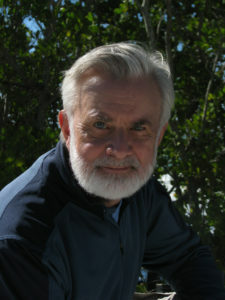 James R. Benn is the author of Desperate Ground, Souvenir, and the Billy Boyle World War II mysteries. His books have received starred reviews in Publishers Weekly and Library Journal and have been listed as the Bookpage Mystery of the Month. Two have been tagged a “Killer Book” by the Independent Mystery Booksellers Association. A Blind Goddess was longlisted for the International IMPAC Dublin Literary Award and The Rest Is Silence was a Barry Award nominee. A librarian for many years, Benn lives in Connecticut with his wife, Deborah Mandel.